When a father is sent overseas to fight during WWII, he tells his young son to be brave. This idea of war is scary for the boy, but so are some of the daily things in his life, like the air raid sirens, and thinking about bombs and guns. The young boy is especially afraid of the trade horses who come down his street. First, there is the ragman's large horse Josephina. When the ragman comes around to collect rags, paper and even metal for the war effort, the boy shies away from the horse. Seeing that, the ragman asks if he would like to feed the horse a carrot and make friends with it, but the boy is too scared to do it. He feels the same way about the milkman's horse Nell when they come down the street pulling the milk cart. He has the same reaction to the garbage man's horse when they come to collect the trash. 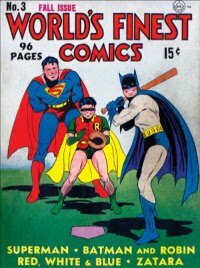 But all the while, the young boy remembers the story his father told him about the time he had been bitten on the shoulder by one of the horses on his father's farm as a boy. He, too, developed a fear of horses, but his father needed his help on the farm. The boy's father told him that sometimes, if it's important enough, you just have to do things even if you are scared. Meanwhile, the young boy is trying to think of a wonderful birthday present he could get his dad with his jar of saved pennies. One day, the pony man shows up and asks the boy if he would like his picture taken on the pony. But the boy, who has been remembering all the horse stories his dad had told him, declines the offer. Suddenly, remembering his father's words about being brave, the boy knows just what would be the perfect gift to send his dad - a photo of him bravely sitting on the pony. A gift for his father is important to the boy, but, can he, like his father, put aside he fear long enough to have the photo taken? 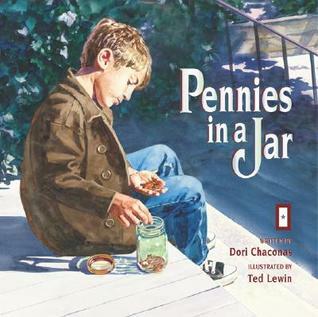 Pennies in a Jar is such an inspirational story for young readers. All children have fears, some rational, some irrational, but finding the courage to overcome what they are afraid of is an important step, especially when they are separated from a parent fighting in a war and worried about them. In that respect, even though this story takes place in WWII, and we know longer have trade horses coming down our streets on a regular basis, this is a book that will still resonate with many kids today. After all, it's not about the horses, it's about being brave. Ted Lewin's realistically detailed watercolor illustrations add depth and expressiveness to the story by creating the world of a small town during WWII. They will remind you of the paintings done by Norman Rockwell in the 1940s, who also liked to capture life's small important moments in small town daily life. There is a Note from the Author at the back of the book describing what life was like during the war -games kids played, how people passed the time, rationing and kids doing what they could for the war effort. And, of course, being brave during difficult times. This is an excellent book for starting many different kinds of conversations and would make a wonderful addition to any classroom or home school library.